Thank you to all who joined us on our 2018 tour season, and look forward to 2019! 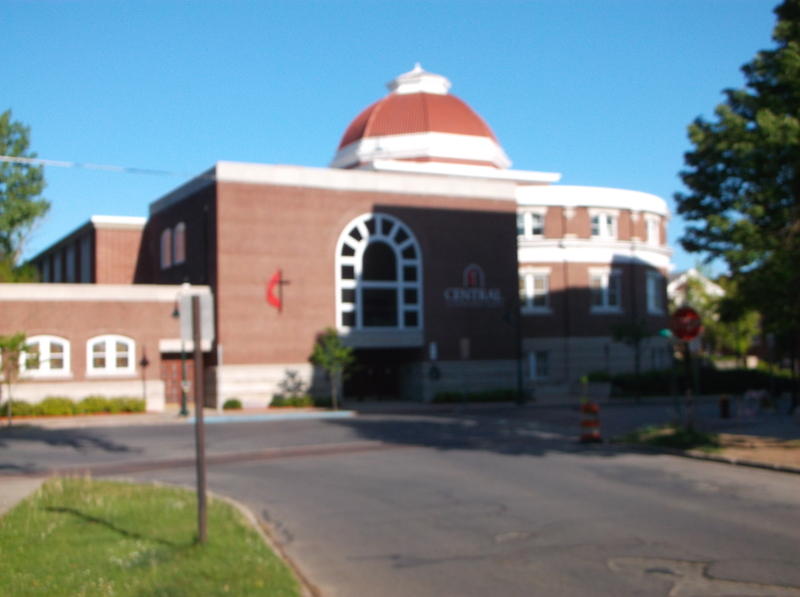 The Traverse Area Historical Society offers 3 standard docent led tours and 1 virtual downtown tour to those who are interested in learning more about our rich local history. In addition, custom tours can be arranged by contacting TAHS. Our standard tours are free of charge; however, we do have a suggested donation of $10 per person. 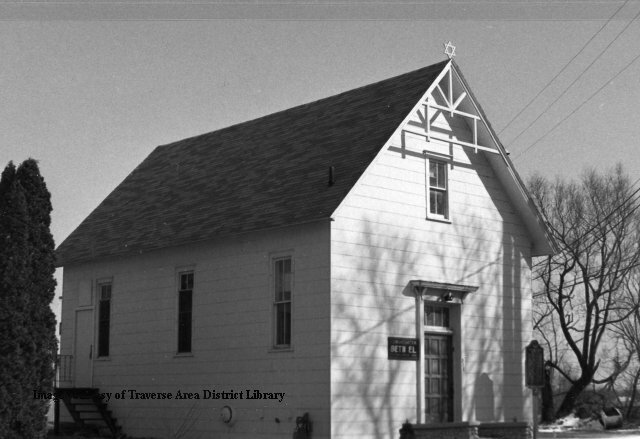 Any and all donations are strictly voluntary and are used by the Traverse Area Historical Society to further our mission to Preserve, Protect, and Present the history of the Grand Traverse Area. Please note: no donations are used to compensate any TAHS members, tour guides, or tour guide assistants as our organization is a strictly volunteer group of individuals. No reservations are required, however participants are required to sign a liability waiver so please arrive by 10:15am for sign-in. New this year! The downtown walking tours meet at the Perry Hannah statue at the corner of Sixth and Union Streets. The tour will start and finish at this location. 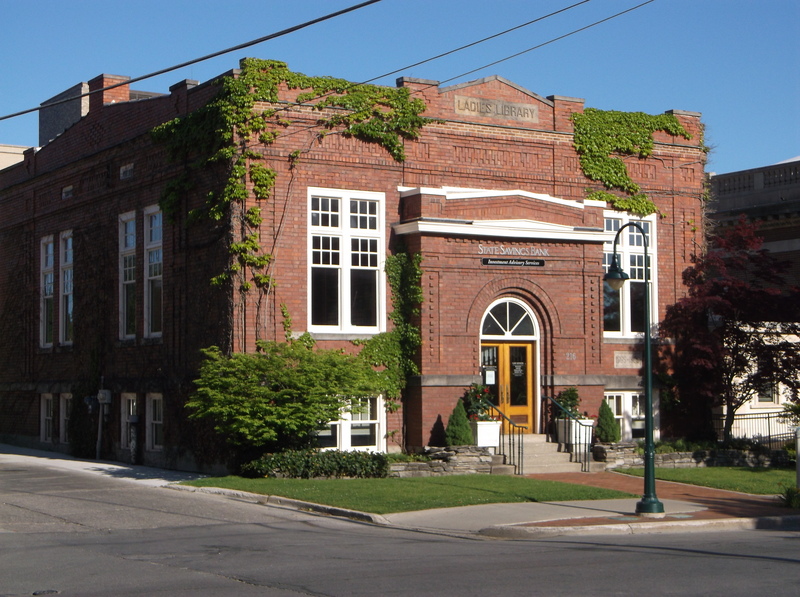 These tours are conducted by guides with a special interest in Traverse City history, and provide a rich experience of Traverse City’s past. Please note: This walking tour covers a distance of approximately 1.5 miles on uneven surfaces over 90 minutes, so please consider if this tour is appropriate for your mobility and stamina capabilities. Additionally, while kid-friendly, some children have difficulty staying interested for the duration and you are the best judge of the appropriateness of this tour for any children who may accompany you. In case of inclement weather, please check our Facebook page to see if the event has been canceled. We do our best to have any cancellation notice posted at least 1 hour prior to the tour. No reservations are required, however participants are required to sign a liability waiver so please arrive by 3:45pm for sign-in. Cemetery walking tours meet at the main entrance of Oakwood Cemetery off of Eighth Street, directly across from the intersection of Fair Street and Eighth Street. The tour will start and finish at this location. Parking is available on either side of the entrance, up against the hedge . No reservations are required, however participants are required to sign a liability waiver so please arrive by 4:45pm for sign-in. 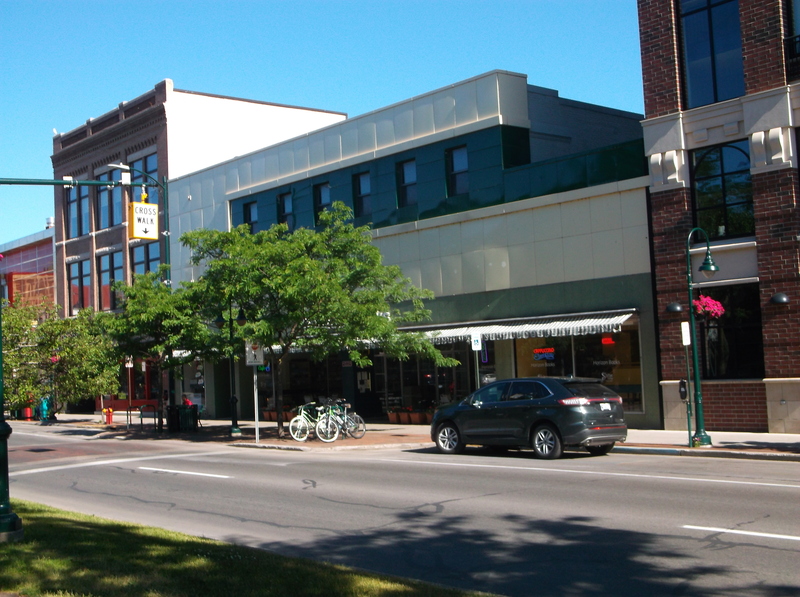 This virtual walking tour of downtown Traverse City is presented free of charge to all persons with an interest in our shared history. It may be used as a guide for those walking with an internet-capable device, as a helpful aid for those not able to walk the approximate 1.5 mile trip, or as an illustrated tour for persons who may not live in the Traverse City area. 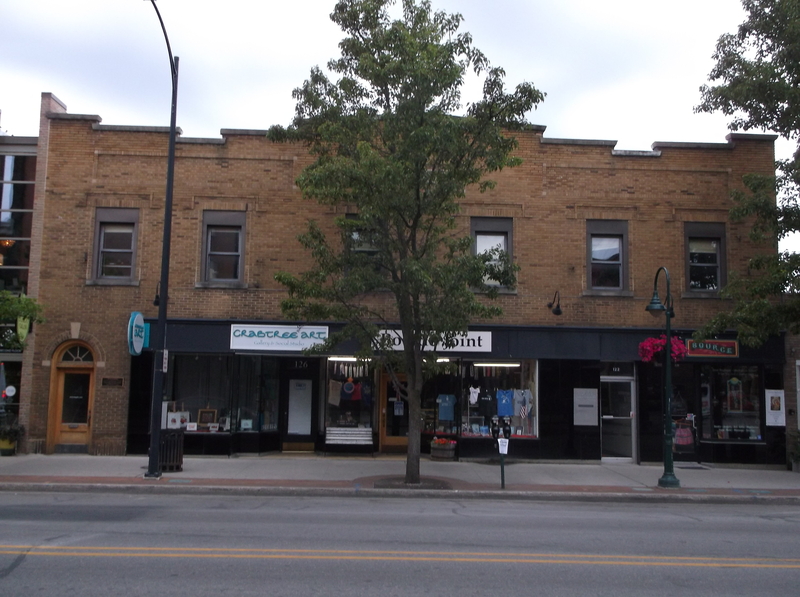 Horizon Books: Formerly the Penney’s store, it was built in 1926. 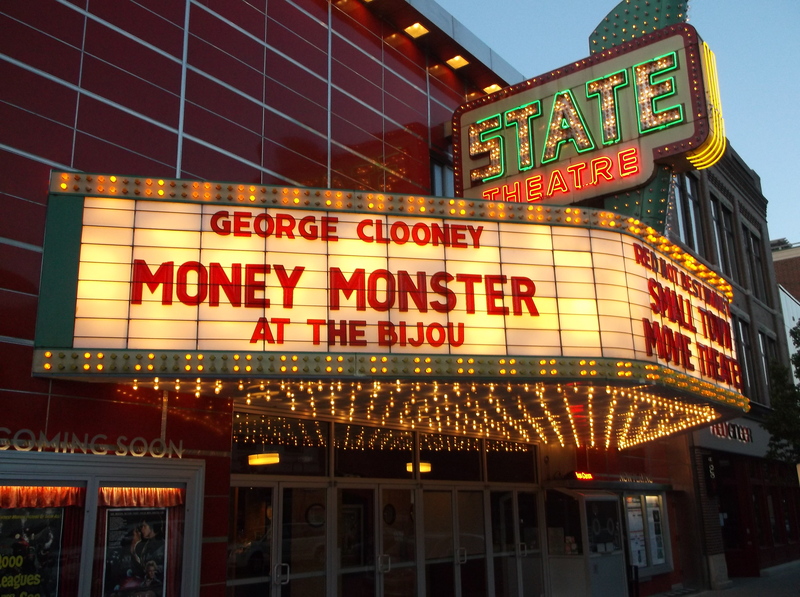 State Theater, home of the Traverse City Film Festival, represents Art Moderne style with its flashing marquee, glossy panels, and soffit lighting. The inside features a full balcony with a glorious starry ceiling that shows summer constellations. 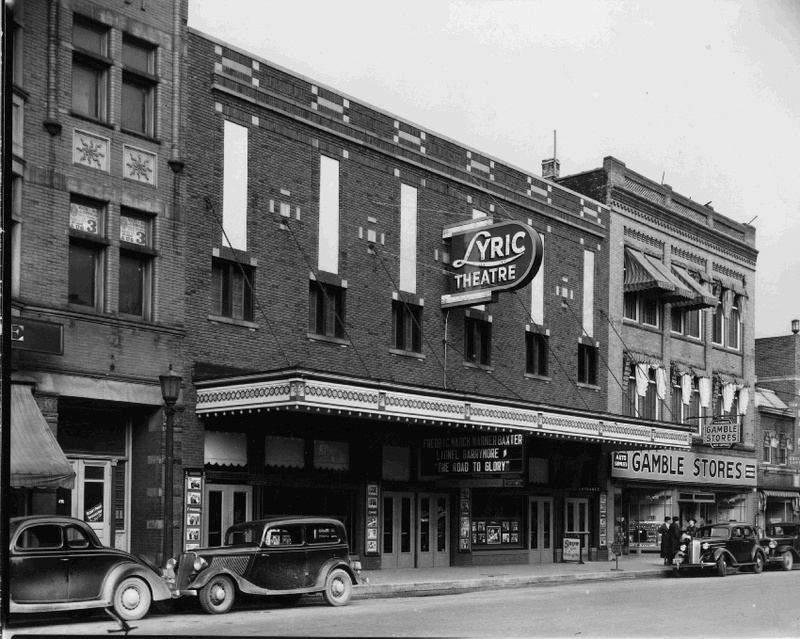 The Lyric theater occupied this space until 1948 when it was destroyed by fire. Behind the theater, in 1924, TNT was detonated, the perpetrator thought to be a member of the KKK. At the time the Klan was active in the area, much of its effort directed against Catholics and immigrants. 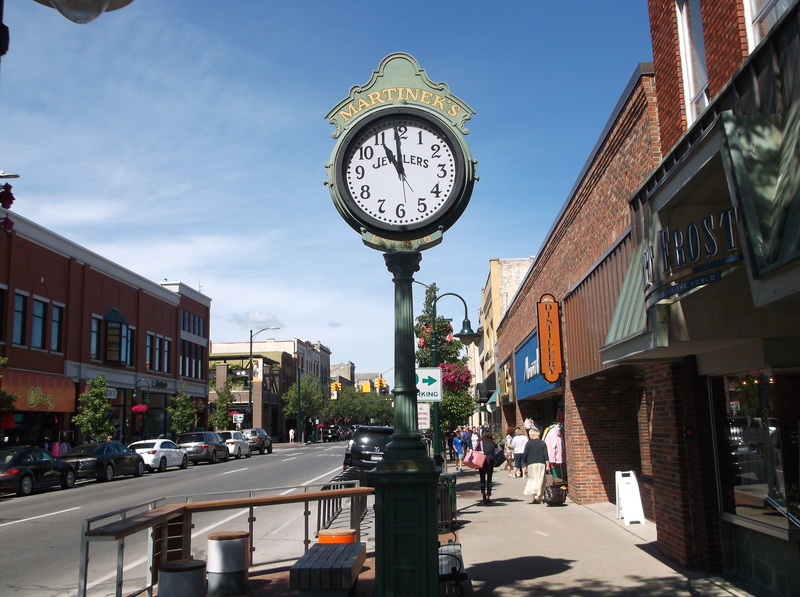 Martinek Clock: Martinek Jewelers occupied this building until relatively recently. The clock has its original workings and must be wound every three days. Old National Bank and Trust/People’s Savings Bank (corner of Cass and Front). As a relic, observe the deposit box at side of building. 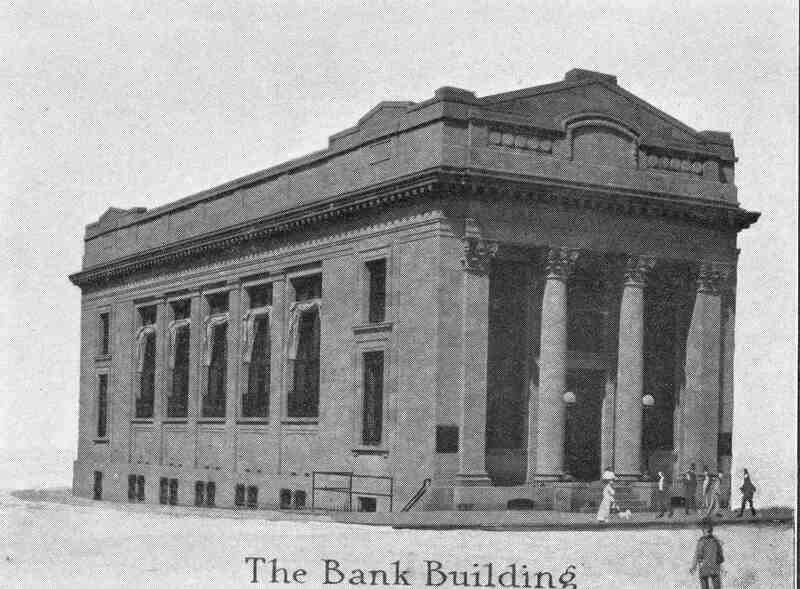 Note the transformation of the old bank to its modern configuration. 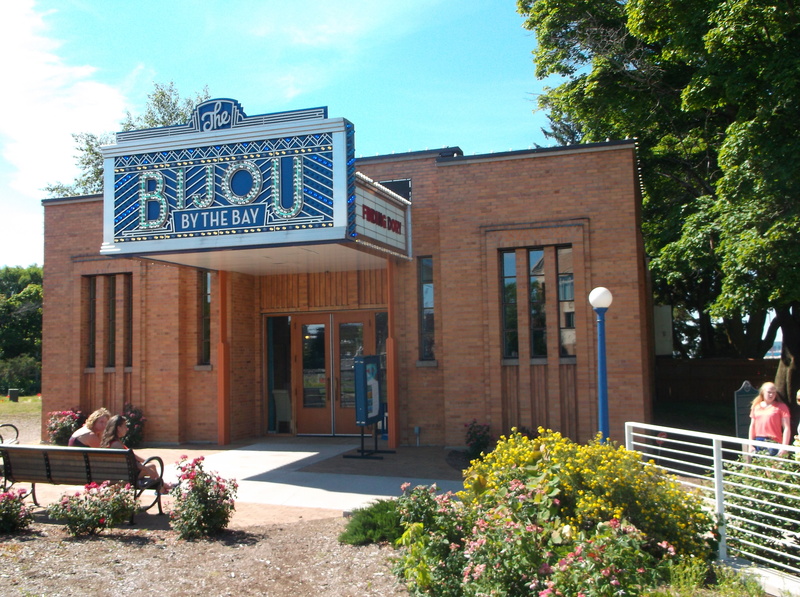 View of the Waterfront: Note the Bijou Theater, formerly the Con Foster Museum, built in the 1934. 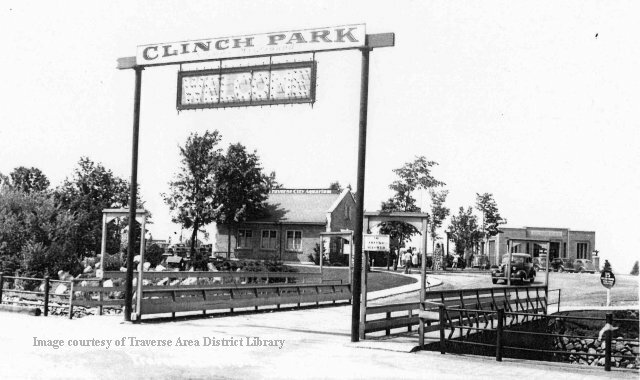 Clinch Park was created in 1931 through a community effort: After a bond failed to establish a new city park, city leaders organized a city-wide volunteer effort. Five hundred workers were expected to participate, each business downtown supplying two of them. Citizens brought 37 small trucks, two tractors, two steam cranes, and a flotilla of 12 boats to remove the mud, stones, debris, and concrete slabs from the Bay. The Women’s Club prepared 42 pans of beans to feed the multitude, prepared in 42 separate kitchens. At the end of the day the R-E noted how many unemployed men had participated (this was the middle of the Great Depression), approving their sacrifice. 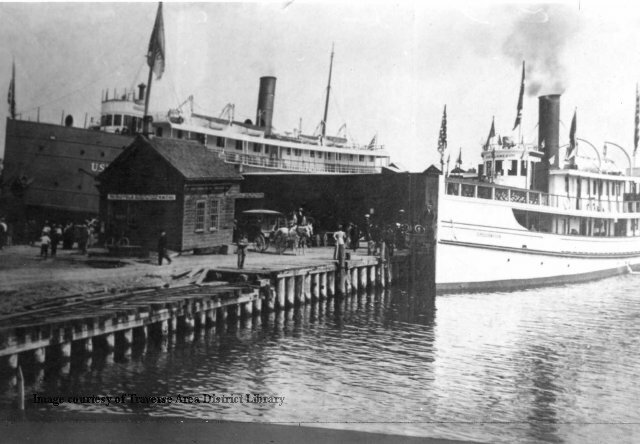 Before 1930, the waterfront was devoted to industry and to transportation, with railroads and boats (both passenger and freight) occupying much of the space. At this time Traverse City proper did not seek to attract visitors to this place by providing scenic views or clean beaches. 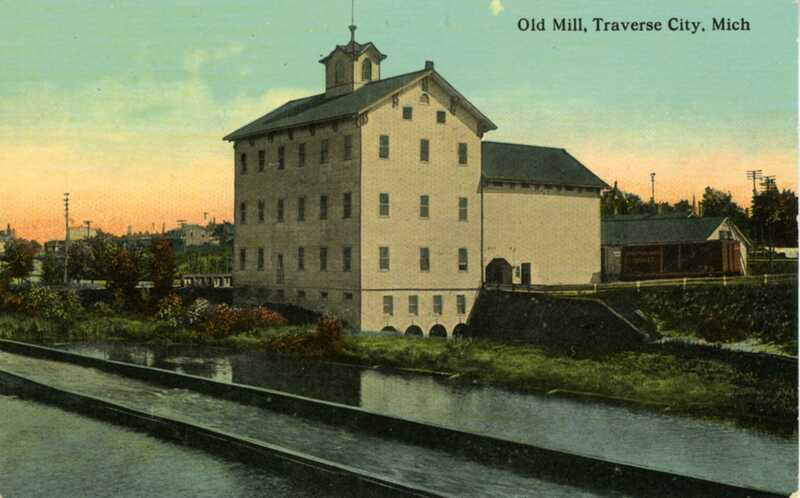 Before that, it was the site of one of the first logging operations in the area, the Hannah-Lay steam-powered mill. 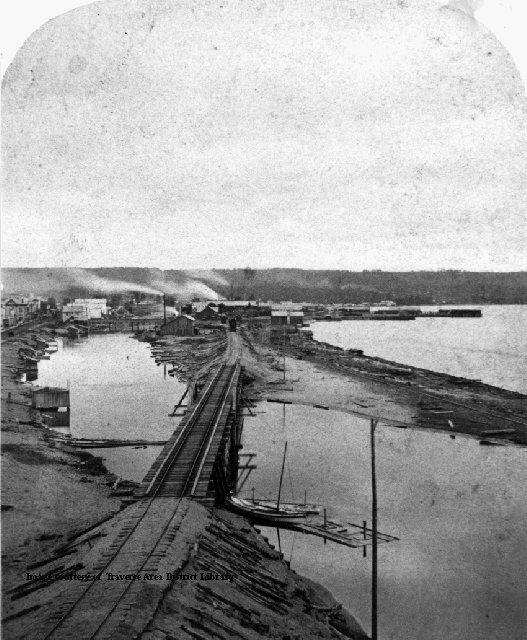 Lumber was shipped out from the wharf all over the country, but to Chicago in particular after the great fire of 1871. Whiting Hotel: Formerly a relatively elegant hotel, it has been transformed into inexpensive studio apartments. 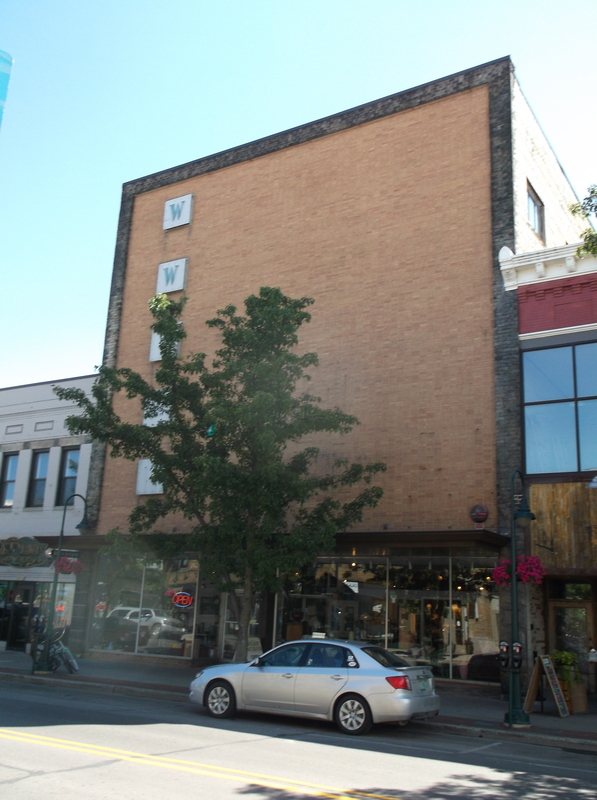 Constructed in 1893, it is one of the oldest brick buildings in the downtown area. 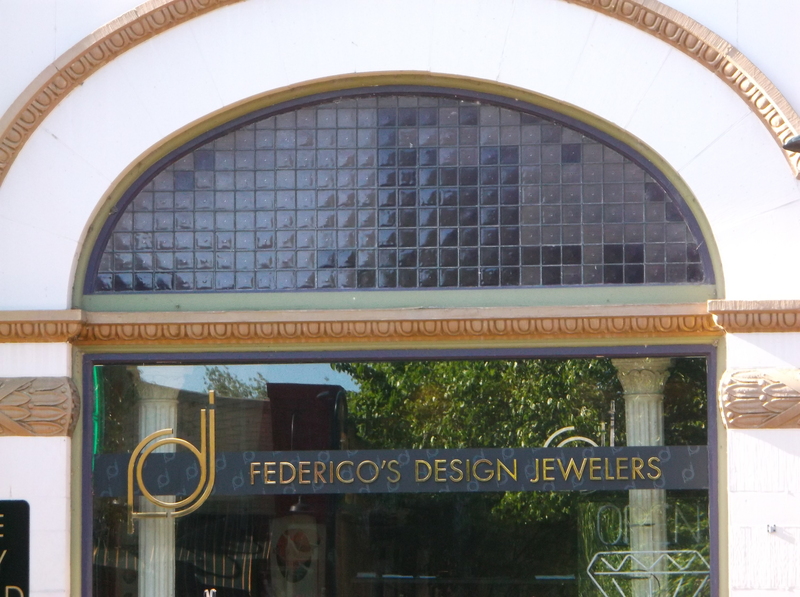 Note the prismatic glass above Federicos. 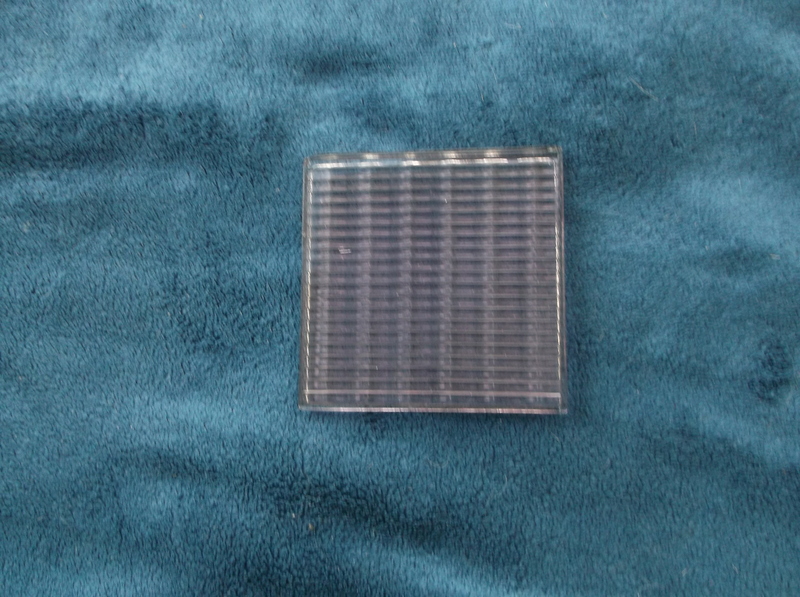 Its purpose is to let light into businesses at a time when electric lights provided poor illumination. 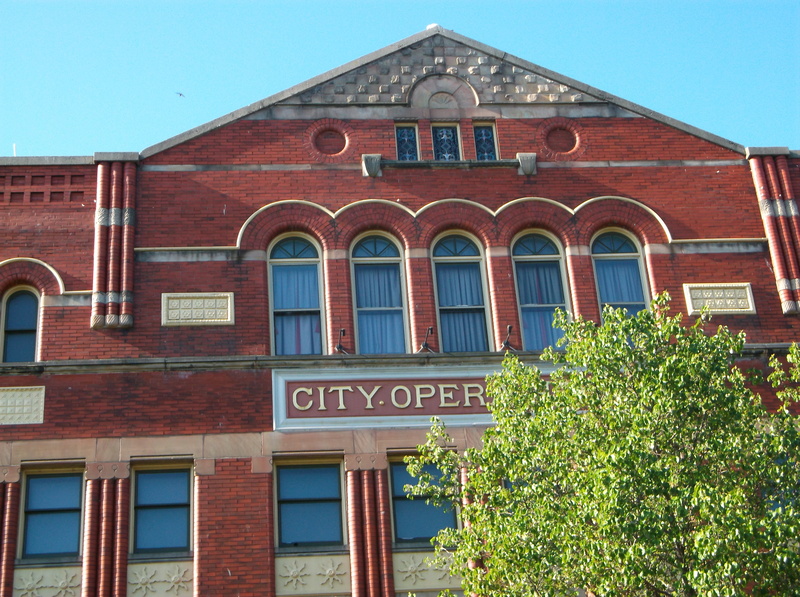 City Opera House building: Its architectural style is Richardsonian Romanesque as shown by its narrow arches and massive brick exterior. Erected in 1892, it closed after 1920, was later refurbished beginning in 1980, and finally reopened in 1985. Currently features plays, concerts, and other performances from around the world. 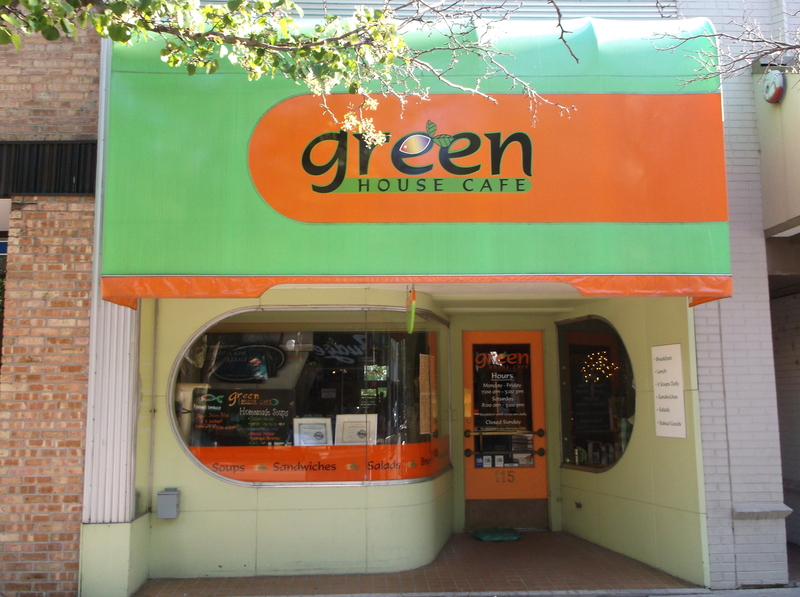 Green House Café: An example of Art Moderne architecture. The rounded glass windows, metal frames, and panels were probably installed in the 1930’s or 40’s. 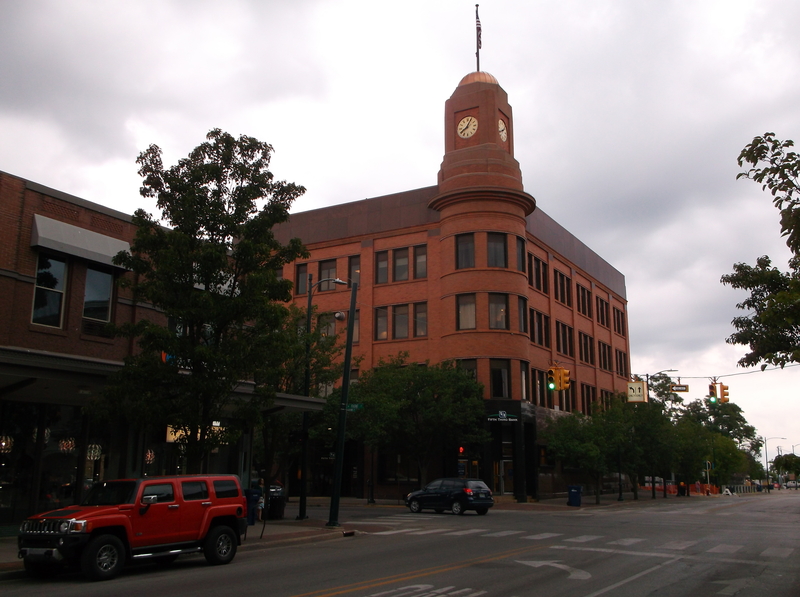 Corner of Front and Union: The Masonic building, built in 1890, occupies the southeast corner of the Union and Front intersection. 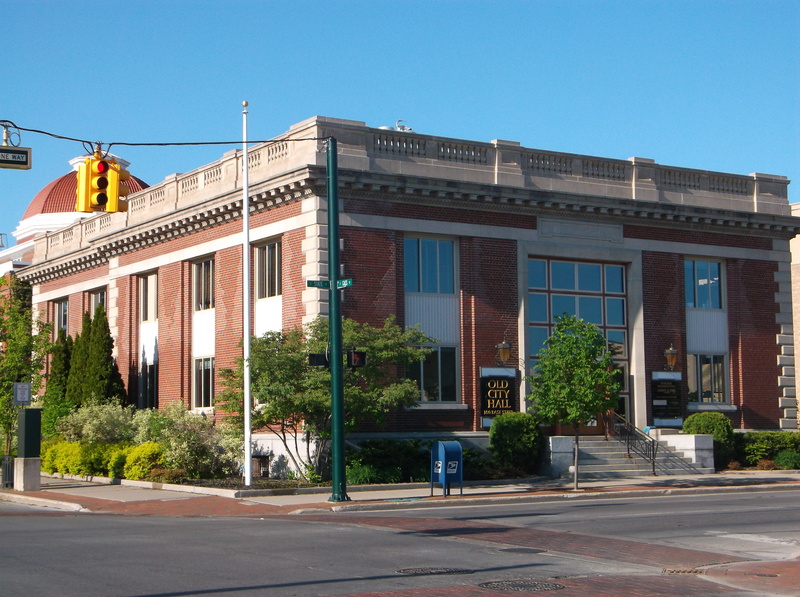 The present 5/3 Bank building used to be called the Traverse City State Bank. It was one of many assets owned by town founder Perry Hannah. 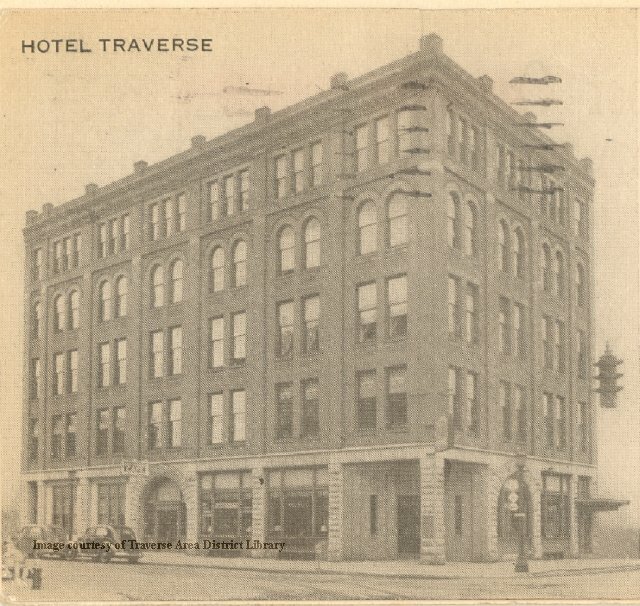 The Traverse Hotel Building stood on the SW corner of the intersection. It burned 1960, leaving only the lower two floors (which remain). 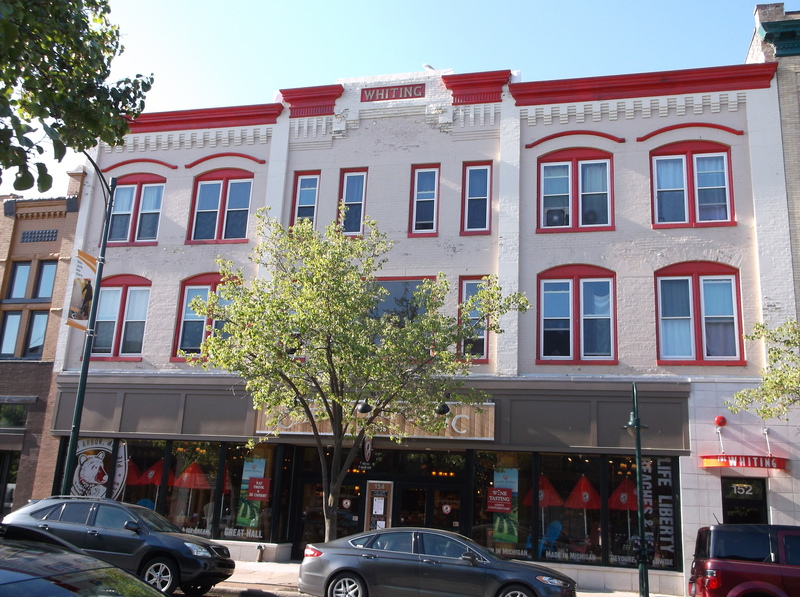 Hannah Lay Mercantile building (1884). The Hannah Lay company split about the time it was built into two branches: logging/real estate and commercial. 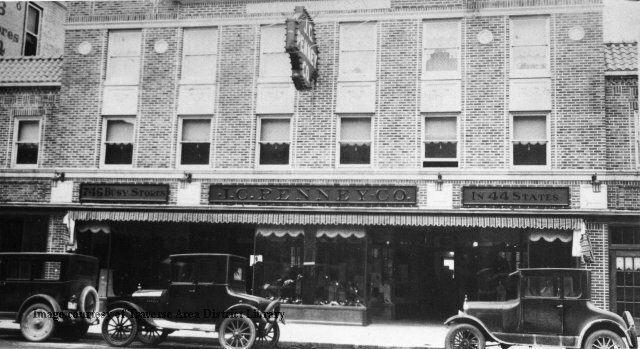 Entrepreneur Perry Hannah knew the logging industry would play out in the years to come, so he had a department store constructed that was the largest (by far) north of Grand Rapids. It closed in 1929 (except for the hardware division, which persisted for a time). A fire took out the eastern-most bay in 1940. Weaver Building. Formerly the Anderson funeral home. 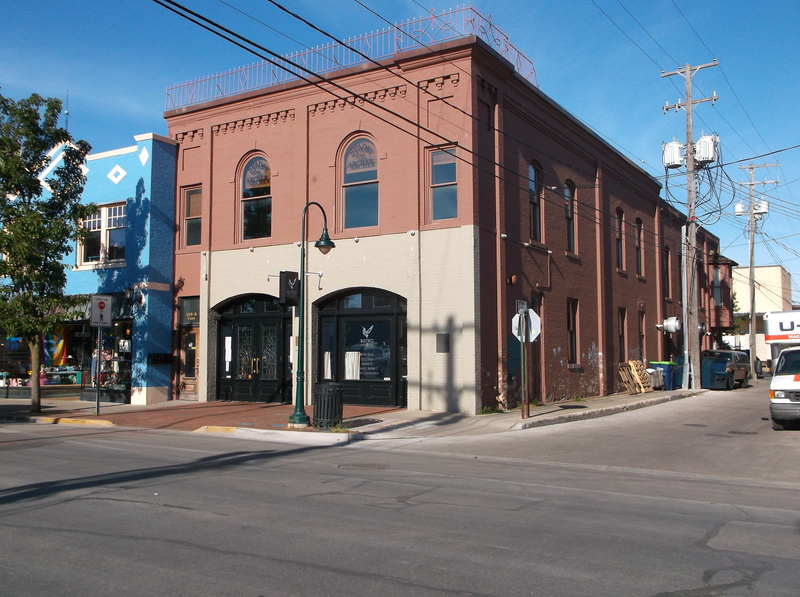 At one time a cigar industry existed on the second floor, the workers almost entirely women. 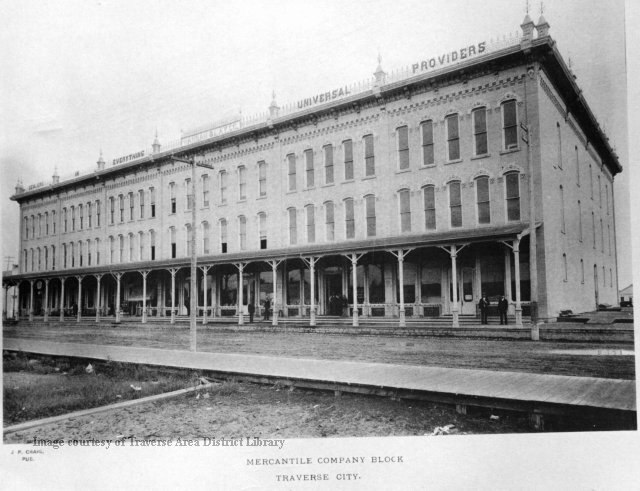 The cigar industry was important to early Traverse City in part because wages were so low that employers could make handsome profits. Wilson’s Antiques building: Formerly Wilson’s Furniture. A fire destroyed the front of the building in 1955. 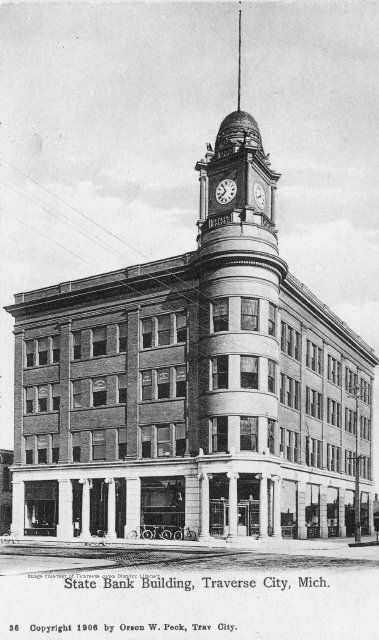 The building featured a roller skating rink on the third floor at the turn of the 20th century, complete with a band that would provide music for the skaters. 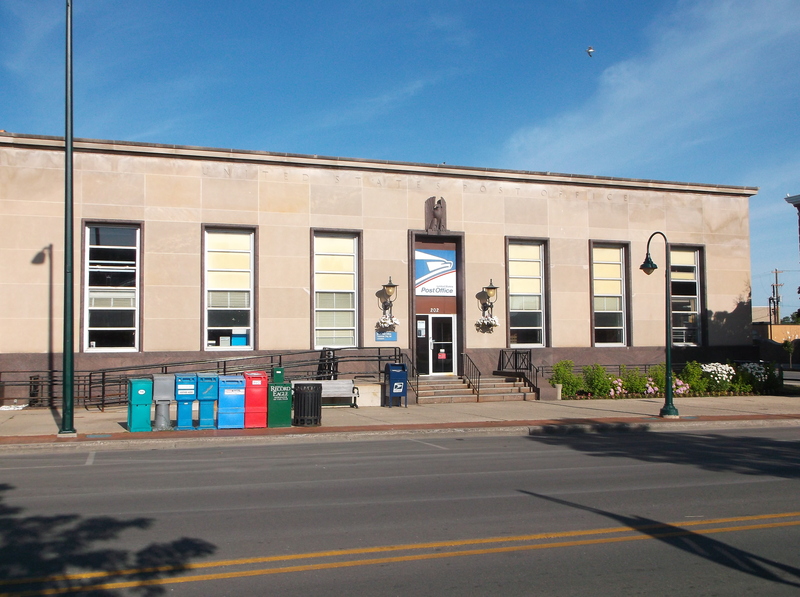 Post Office: Erected in 1937, its construction was funded by FDR’s “stimulus” money. 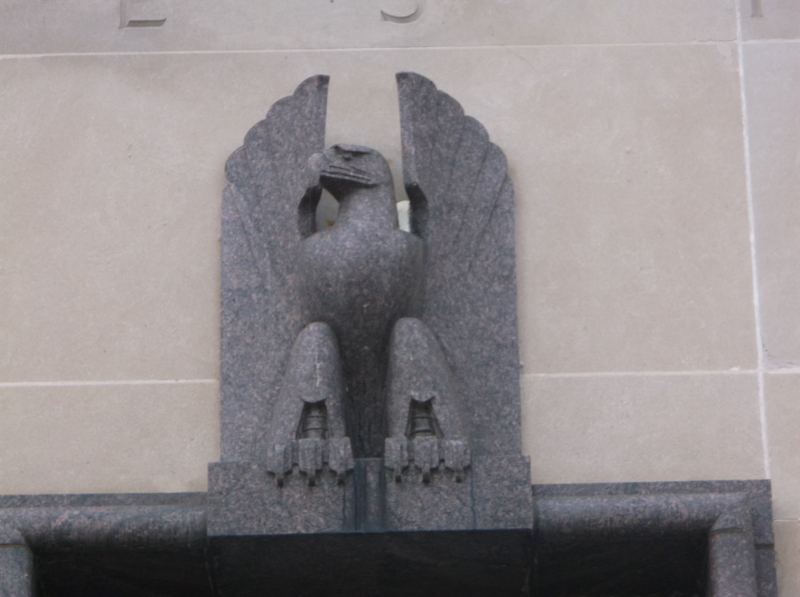 Note the Art Deco features: the lamps on either side of the door, the eagle perched above. Union Street dam: Installed in 1869, the dam supplied power for Perry Hannah’s flour mill (grist mill), an enterprise that lasted until 1926 when it was destroyed by fire. In the early days the dam had a chute for logs, and a wager was made about who could ride a log down the shoot and then stand up on it at the bottom. A former logger named John Bush took the wager, and, in front of 1200 townspeople perched on the trusses of the Union Street bridge, accomplished the feat in 1902. Another time he rode a log he, himself, carried to the Front Street bridge, keeping afloat until he reached the northern Union Street bridge. He was supposed to smoke a cigar the whole way, but the winds being too great, he was excused from that stipulation. Old Bell Telephone building: Built 1927 in Art Deco style, it was designed by Wirt C. Rowland, the architect who designed the Guardian building in Detroit and Hill Auditorium in Ann Arbor. 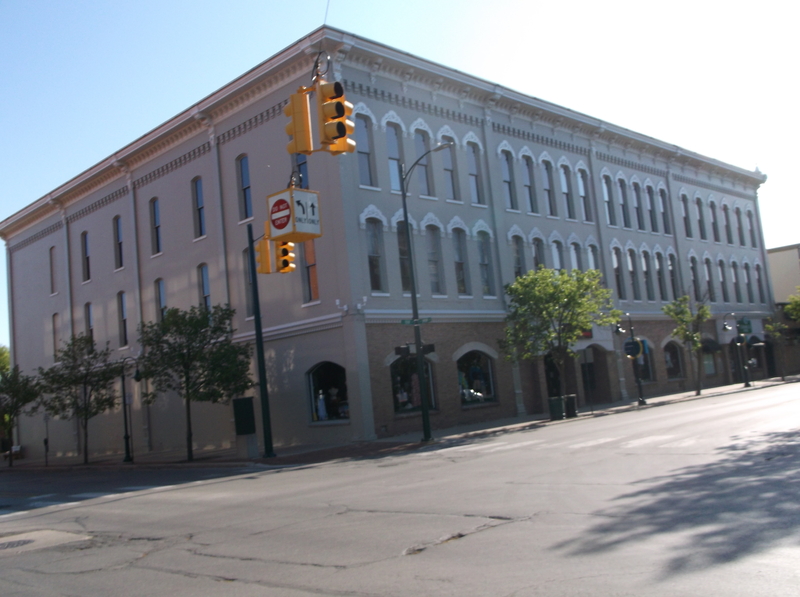 At the corner of Cass and State Streets is the Old City Hall building. 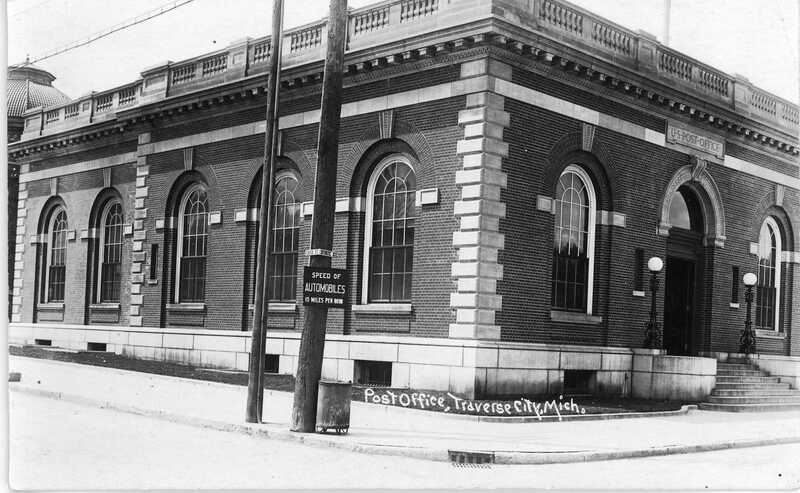 Before serving that purpose, it was the town post office. Designed by John Knox Taylor, Architect of the Treasury, the building was erected in 1904. Taylor was responsible for many post office plans across the United States. 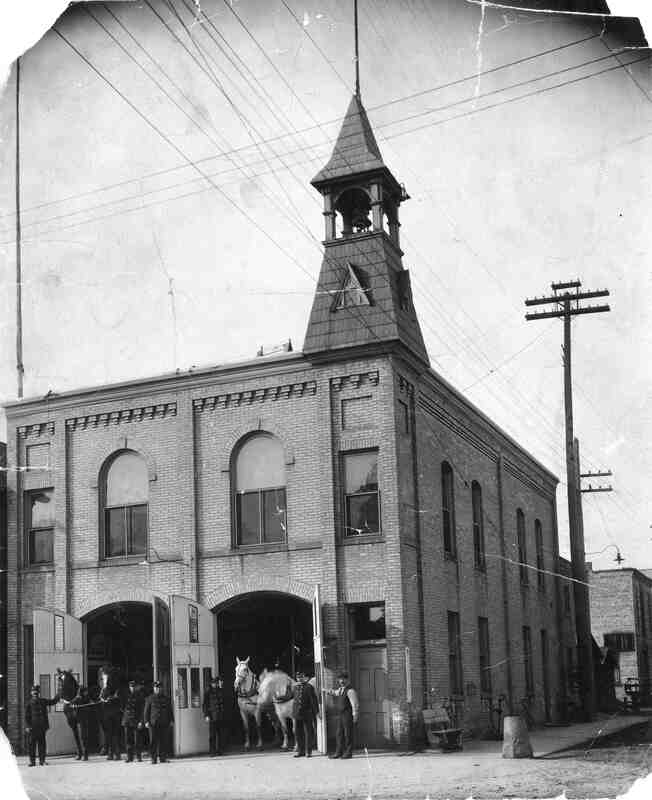 The Old Fire Station: Built in 1886, this building served as a fire station until (approximately) 1975. Originally it had a tall bell tower to announce fires, but that was sacrificed when electronic sirens made their appearance. For a time the city had two teams of matched horses, one black and one white, which pulled the fire wagons through the streets. Steam engines pumped the water through the hoses before the advent of gasoline powered engines. Presently the building serves as a restaurant, though two brass poles used by the firemen are preserved. 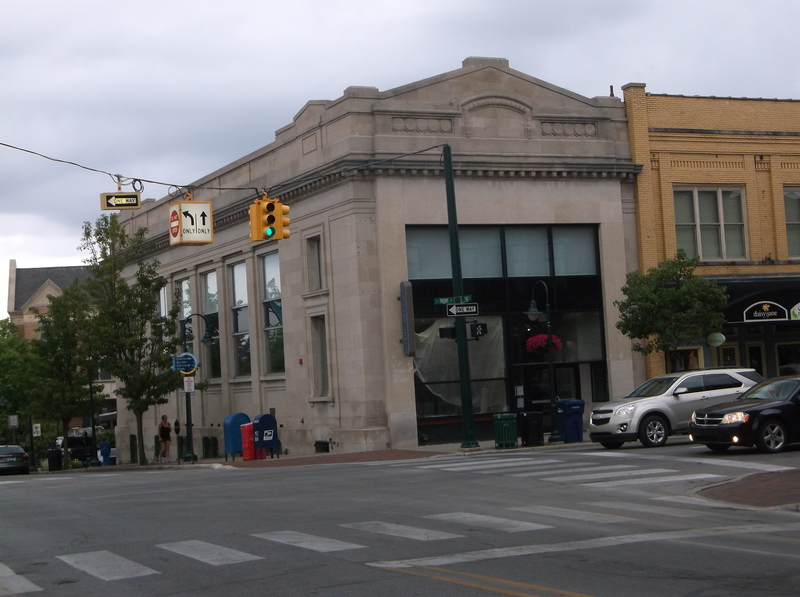 Ladies Library: The Ladies Library was founded in 1869, occupying a large frame building on Front Street. It was one of many in Michigan. The only other state to feature Ladies Libraries is Vermont. Supported solely by the activities of its women members, the Ladies Library offered library services to both men and women until 1940. 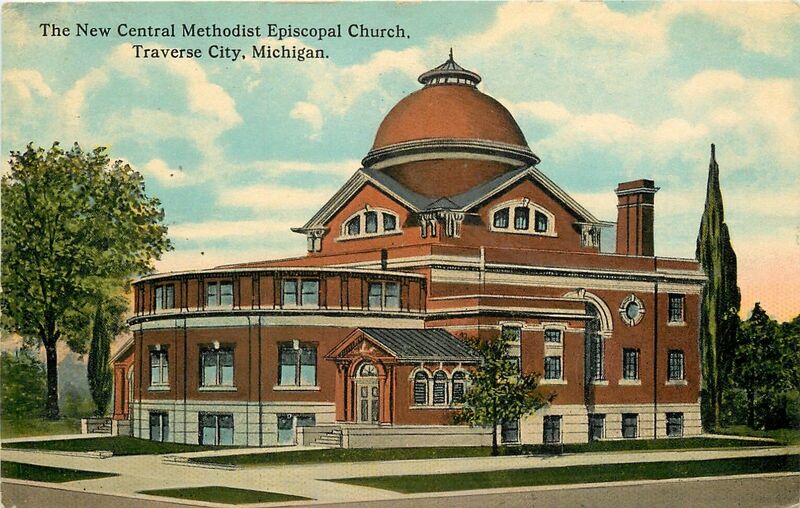 The region of the city especially devoted to churches began at Central Methodist on Cass Street and extended down Washington. 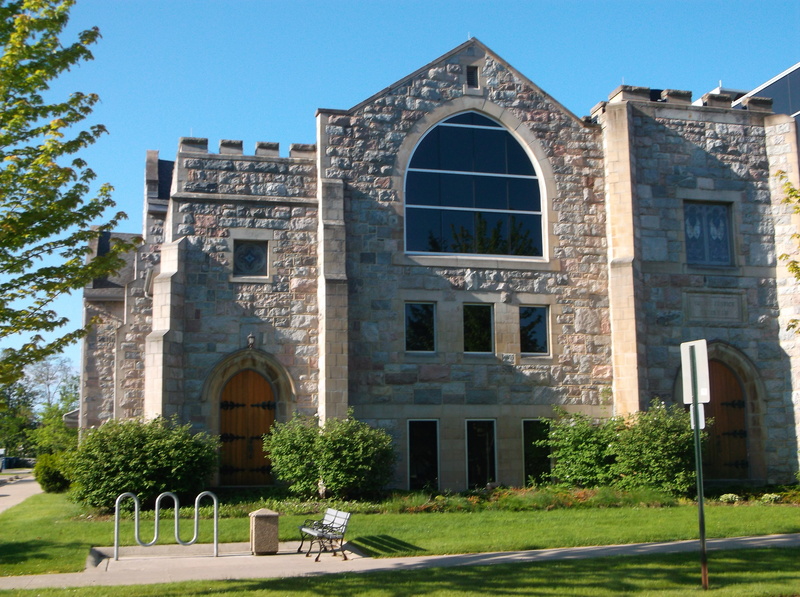 In order, the churches in the district are the First Baptist, Presbyterian, Congregational, and Grace Episcopal. 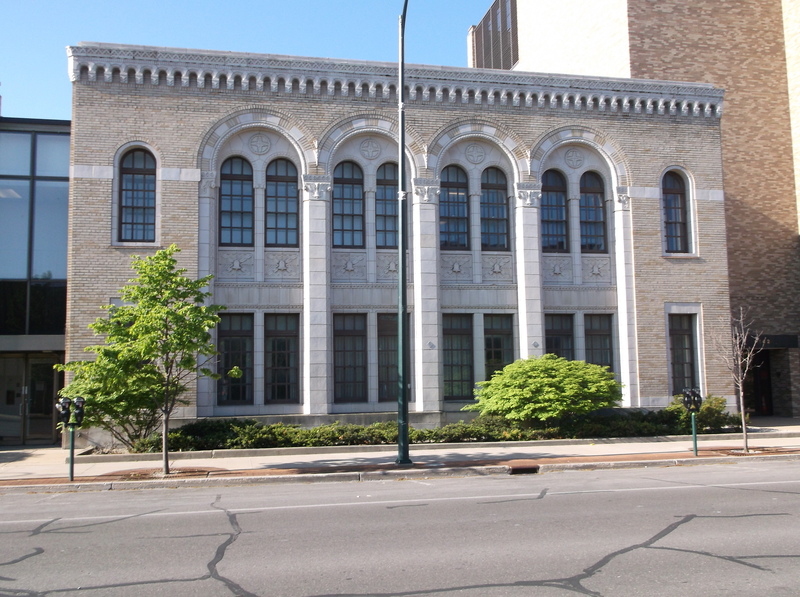 To preserve magnificent stone masonry, the Congregational and Presbyterian churches were preserved to form wings of the Robert P. Griffin Hall of Justice. 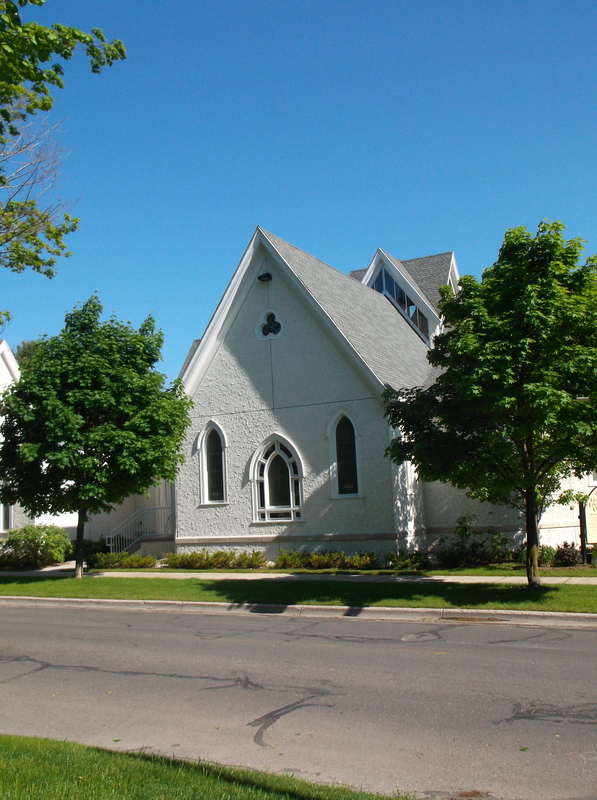 The Congregational church cost between 25 and 32,000 dollars to build at the time, a sum greater than the cost of the Carnegie library on Sixth Street. 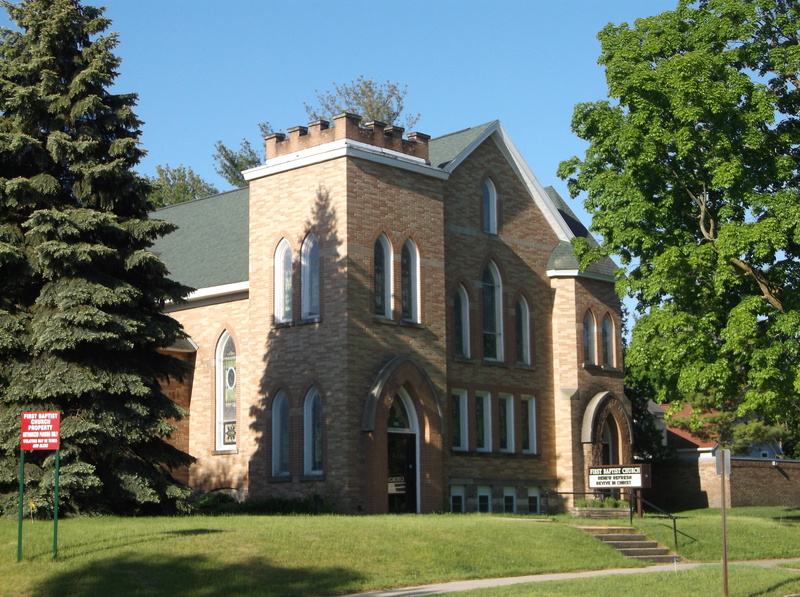 The Congregationalists moved to a large building at the base of Old Mission peninsula in 1960. 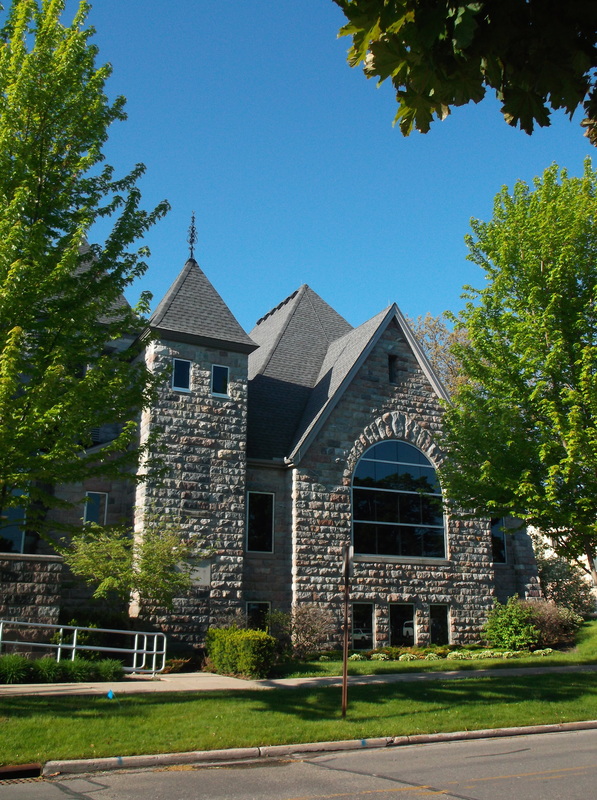 The Congregational Church forms the east wing of the Robert P. Griffin Hall of Justice and a former Presbyterian Church makes up the west wing. Across the street, Grace Episcopal was built in 1876. 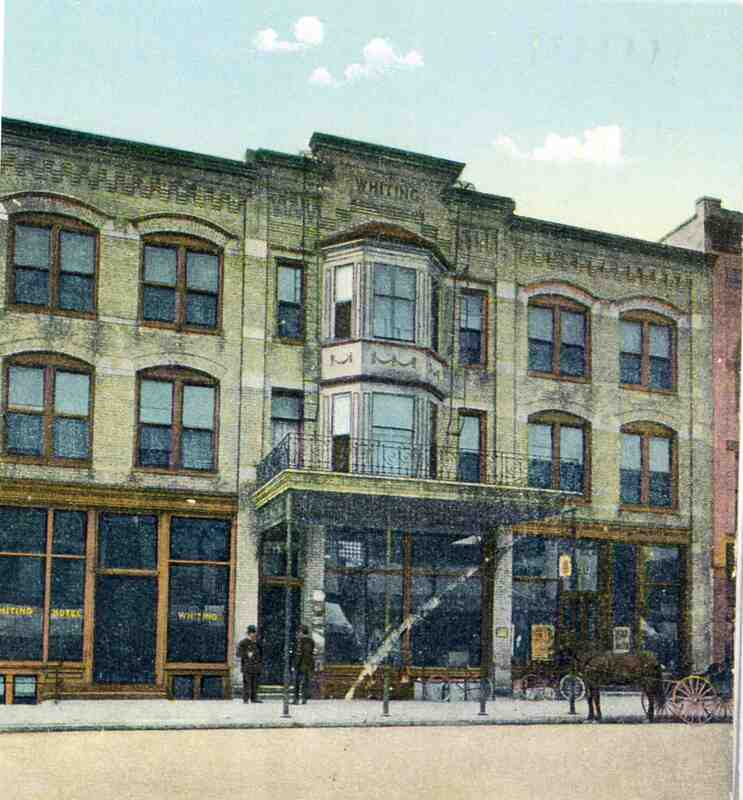 That building was moved by horse to his location in 1897. In 2005 parts of the original building were retained in enlarging the sanctuary—including some stained glass windows. Beth El: Said to be the oldest synagogue still in service to its members since 1885. Land for the synagogue was donated by Perry Hannah, one of the town’s founders. 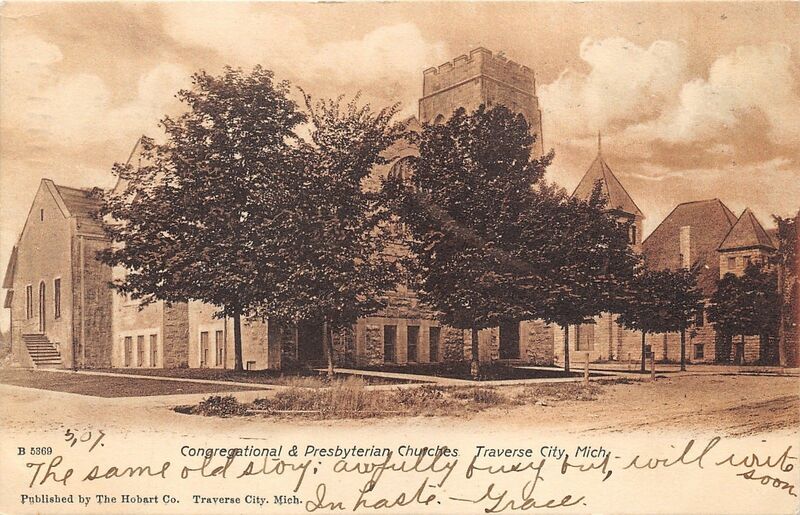 The Jewish community in early Traverse City consisted of Russian Jews, some of whom escaped the tyranny (and conscription) of Czar Nicholas in the late nineteenth and early twentieth centuries. One of them, Julius Steinberg, became important in the city, starting his own department store and building his own opera house. In later years the Russian Jewish community evaporated, to be replaced by Jews engaged in medicine, business, law, and other professions. 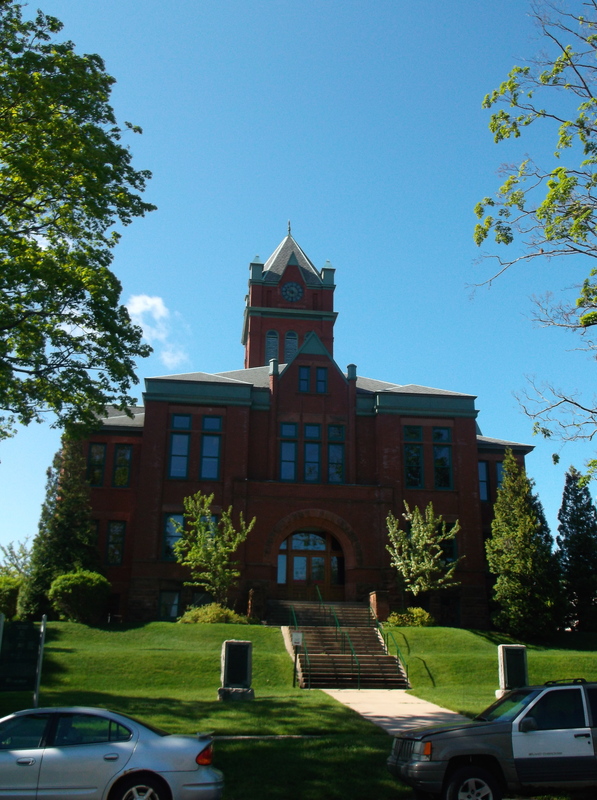 Grand Traverse County Courthouse: Built in 1900, the courthouse was considered the center of the community. Famous speakers—like William Jennings Bryan–would come to speak on the courthouse steps. 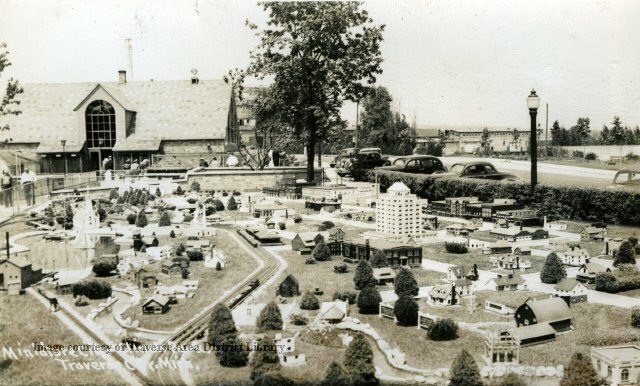 In 1984 it was saved from demolition by the actions concerned citizens. Now it is especially beloved for the tones of its bell tower, recently restored after many years of silence. Trail marking tree: The curious zigzag of the first branch has triggered speculation that this white oak served as a trail making tree before white settlement. In the 1890’s the tree was first photographed, that image showing it to be quite large, perhaps big enough to have been a sapling before white settlement. 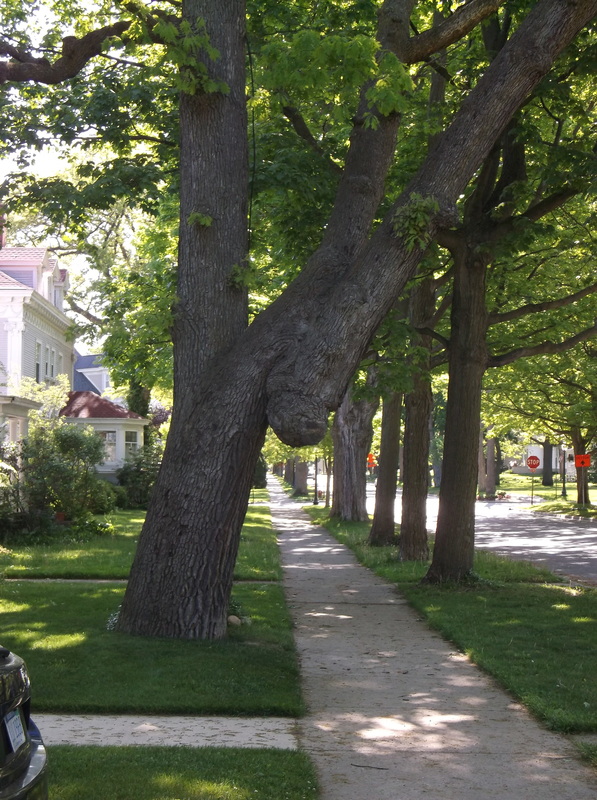 It is still unclear as to whether the configuration of the tree is manmade or natural. 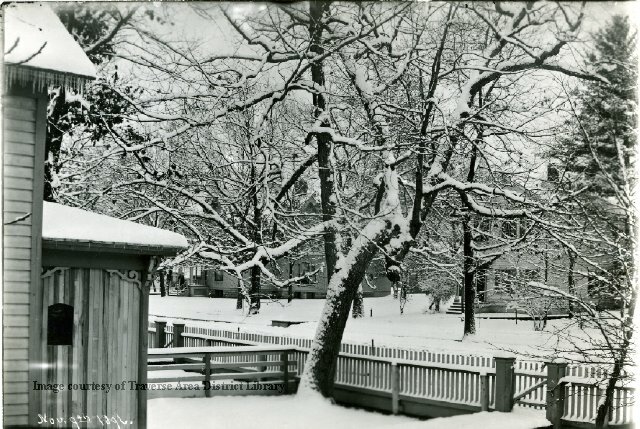 Another such tree exists on the Civic Center grounds, though its stem was bent horizontal close to the ground. 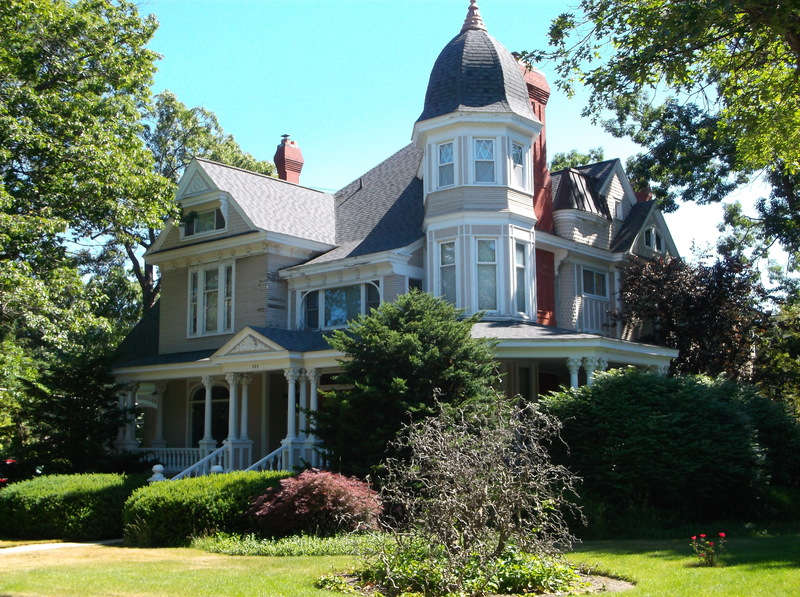 Park Place: Originally called the Campbell House, the Park Place was built in 1879. Perry Hannah purchased the hotel soon after that. The present building was erected in 1930, about the time Detroit and Chicago began to build much taller skyscrapers. The Park Place had one feature that made it their equal—a powerful beacon that could be seen from 25 miles away (or so it was reported). Traveling on a circular track around a central chimney, the light generated 2.5 million candlepower, more than the Palmolive Building in Chicago. Now it has only a weak beacon that is directed at the Bay. 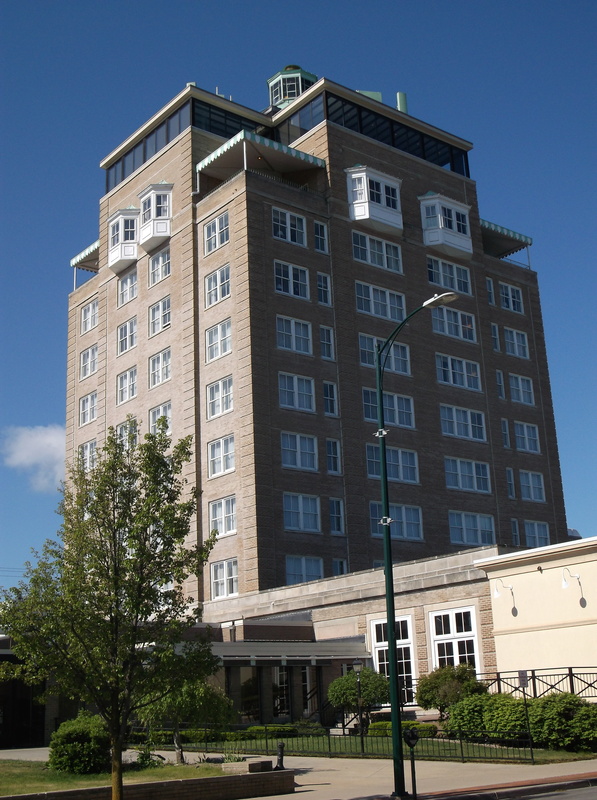 The Park Place is counted as a federally recognized lighthouse by the Coast Guard. 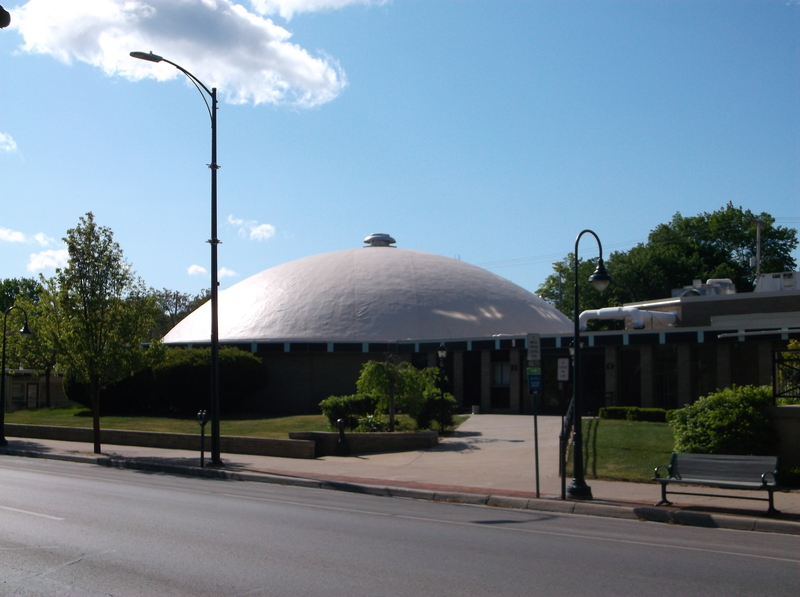 Soon to be razed, the Park Place dome was revolutionary in its design and construction method. For many years, it served as home for the Cherry County Playhouse, a long-time summer stock venue. 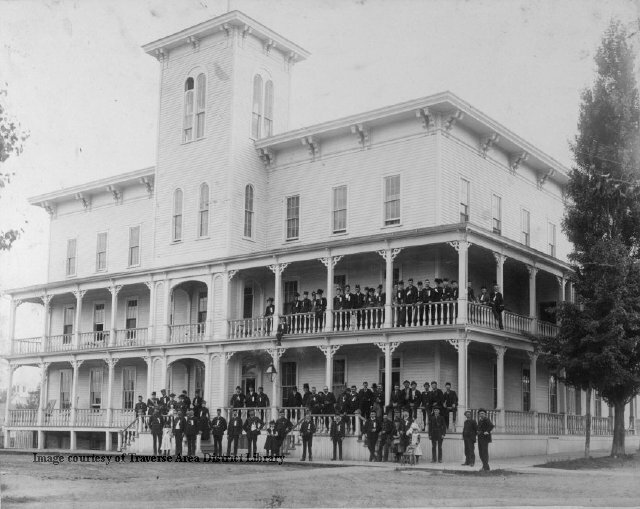 Home of Winton C. Hull: W.C. Hull was the son of Henry S. Hull, founder of the Oval Wood Dish Company, at one time the largest employer in the city. 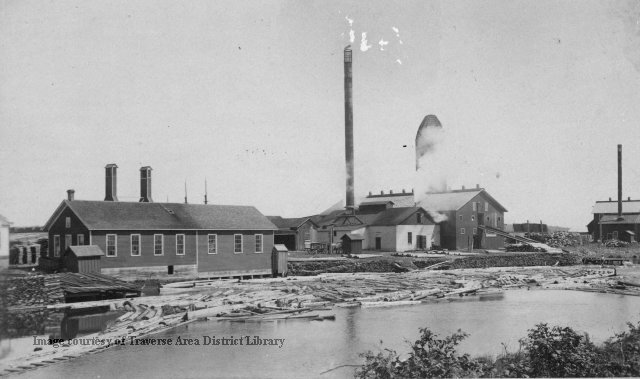 The factory was located near the present library at the north end of Boardman Lake, and manufactured oval wood dishes (used for butter, meats, and the like), clothespins, flooring, and other hardwood products. 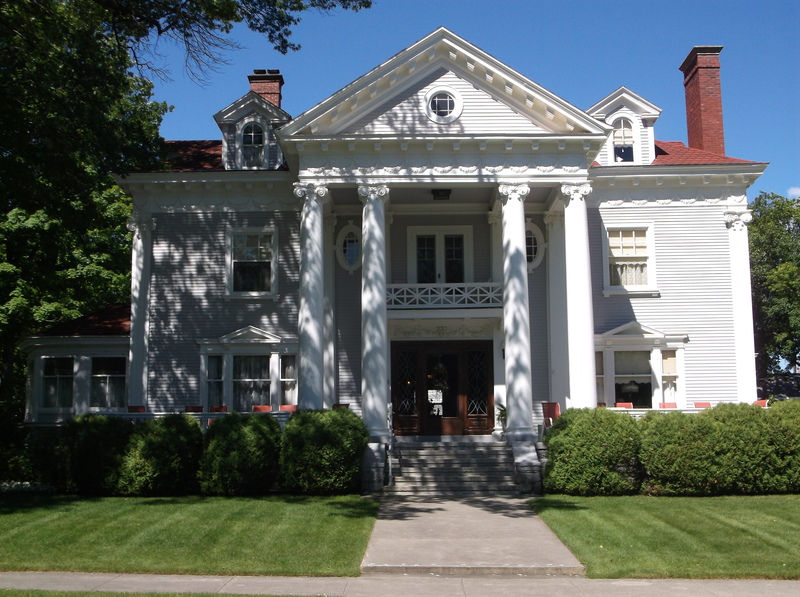 Designed in Ionian classical style, the home was built in 1908. That of his father is located across the street. 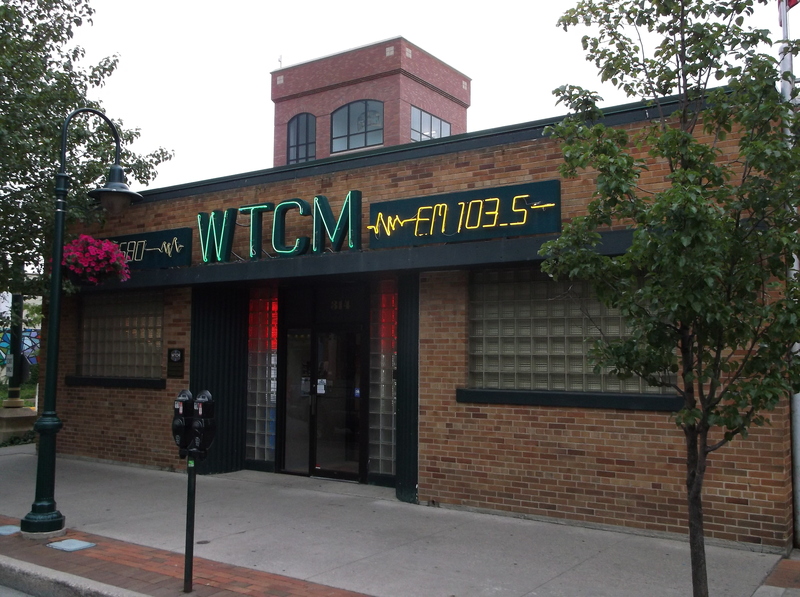 WTCM building: Traverse City got its first radio station (WTCM) in 1941. Founded by Les Biederman, it moved to this location which was constructed in 1949. The building showcases the dominant design of its day with its rounded corners, neon lights, and the use of glass bricks.